Informative and educational information regarding process instrumentation, industrial controls, control valves, over-pressure protection, field instruments, and sensors. This blog is intended to help specifiers and users of process control equipment to better understand how these products work, and how best they should be applied. For more information visit the Flow-Tech website, or call 410-666-3200 (in Maryland) or 804-752-3450 (in Virginia). The differential flow meter is the most common device for measuring fluid flow through pipes. 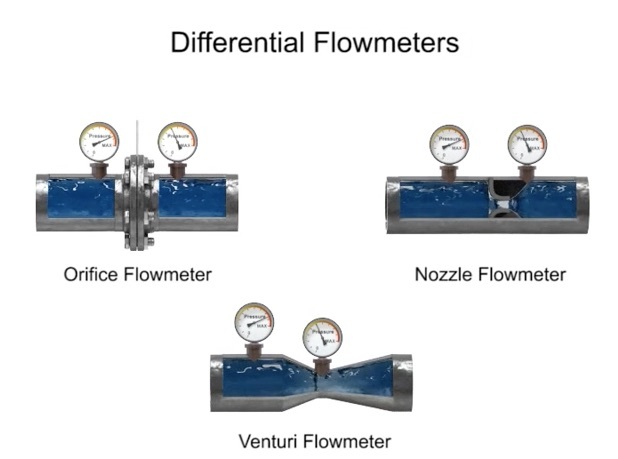 Flow rates and pressure differential of fluids, such as gases vapors and liquids, are explored using the orifice plate flow meter in the video below. The differential flow meter, whether Venturi tube, flow nozzle, or orifice plate style, is an in line instrument that is installed between two pipe flanges. The orifice plate flow meter is comprised the circular metal disc with a specific hole diameter that reduces the fluid flow in the pipe. Pressure taps are added on each side at the orifice plate to measure the pressure differential. According to the Laws of Conservation of Energy, the fluid entering the pipe must equal the mass leaving the pipe during the same period of time. The velocity of the fluid leaving the orifice is greater than the velocity of the fluid entering the orifice. Applying Bernoulli's Principle, the increased fluid velocity results in a decrease in pressure. As the fluid flow rate increases through the pipe, back pressure on the incoming side increases due to the restriction of flow created by the orifice plate. The pressure of the fluid at the downstream side at the orifice plate is less than the incoming side due to the accelerated flow. With a known differential pressure and velocity of the fluid, the volume metric flow rate can be determined. The flow rate “Q”, of a fluid through an orifice plate increases in proportion to the square root the pressure difference on each side multiplied by the K factor. For example if the differential pressure increases by 14 PSI with the K factor of one, the flow rate is increased by 3.74. Plant and process engineers who need accurate flow detection or measurement of air, gases, or liquids in smaller pipe sizes will find several diverse flow instrument solutions available from Fluid Components International (FCI). Using advanced, ultra-reliable thermal dispersion flow measurement technology with no-moving parts, FCI’s ST75 Series and ST100L Air/Gas Flow Meters and FLT93L Flow Switch provide ideal solutions for use in 0.25 to 2 inch (DN6 to DN50) pipe or tubing. They excel where low flows, wide-turndowns, dirty fluids, HazEx or harsh installations are among the applications factors. 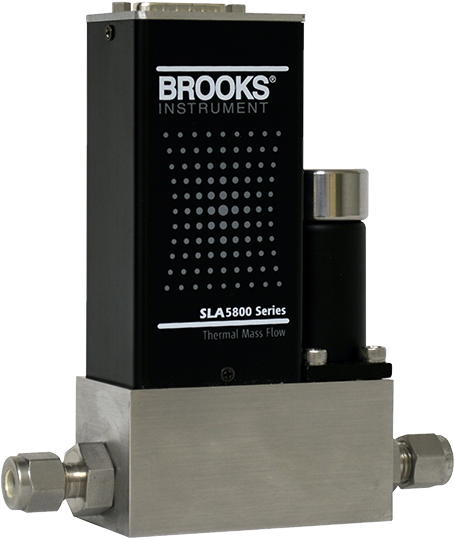 These flow instruments offer many advantages for service in a wide range of applications: plant, building or lab gas sub-metering, small inlet air/gas feed lines for boilers, gas relief valve monitoring, chemical injection, compressed air systems, CO-Gen or CHP gas fuel measurement and control, sampling systems, and more. Many small process line applications are difficult to measure reliably with high repeatability due to variations in temperature and pressure, and have wide flow rates. 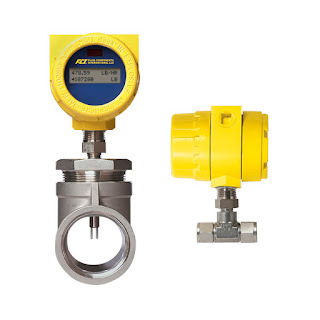 FCI’s thermal flow meters and switches are unaffected by, or have on-board compensation for, temperature and pressure changes and, in addition to superior detection of low flow rates, provide 100:1 turndown as a standard feature. FCI’s highly reliable, small line air/gas flow meters and aid/gas/liquid flow switches combine state-of-art electronics technology with application fluid-matched flow sensors and laboratory calibration in rugged packages designed for the most demanding plant operating environments. 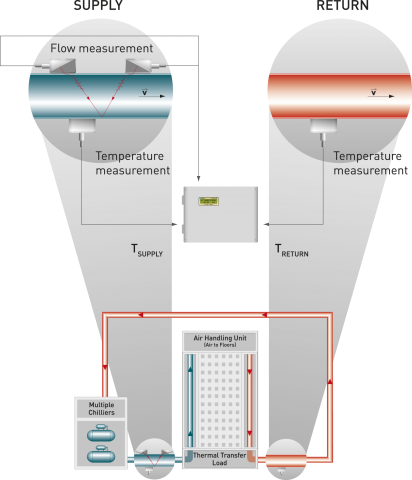 Thermal flow sensor technology developed by FCI relies on the relationship between flow rate and the cooling effect. With no moving parts and minimal invasiveness, these meters and switches provide a highly repeatable, accurate, low cost, easy-to-install solution and there’s virtually no maintenance required over a long life. FCI’s ST75 Series Air/Gas Flow Meters are ideal for lines sizes from 0.25 (6mm) to 2 inches (51mm). Gas or air measurement accuracy is available up to 1% of reading, ±0.5% full scale. The ST75 Meters feature a wide 100:1 turndown and will measure from 0.01 to 559 SCFM [0,01 to 950 NCMH] depending on pipe size. The meter’s electronics are housed in a rugged, IP67 rated enclosure with dual conduit ports in either NPT or M20 threading. The instrument comes standard with dual 4-20 mA outputs and a 500 Hz pulse output. The models ST75A and ST75AV include HART as well as NAMUR compliant 4-20 mA outputs and a SIL compliance rating and 2 year warranty. Global agency approvals for Div.1/Zone 1 HazEx installations include FM, FMc, ATEX, IECEx, EAC and more. 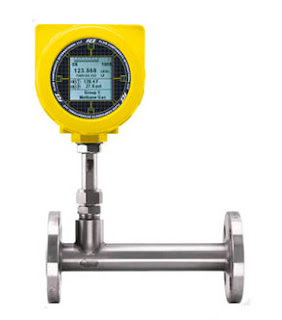 The best-in-class ST100L Air/Gas Flow Meter is a next generation instrument that combines feature- and function- rich electronics with advanced flow sensors. It is designed in a spool piece configuration in 1-, 1.5- or 2-inch tubing, schedule 40 and schedule 80 piping. It measures air/gas flows from 0.0062 to 1850 SCFM [0.01 to 3,140 Nm3/h] with superior accuracy to ± 0.75% reading, ± 0.5% full scale; and repeatability of ± 0.5% reading. Whether the plant’s output needs are traditional 4-20 mA analog, frequency/pulse or advanced digital bus communications such as HART, Foundation Fieldbus, PROFIBUS, or Modbus, the ST100L is available with any of them. Its digital bus communications also are certified and registered devices with HART and Foundation Fieldbus. Global approvals include: FM, FMc, ATEX, CE, CSA, IECEx, EAC, NEPSI and Inmetro. It SIL compliant and is an all-welded design to ensure no leakage when used with volatile gases like hydrogen. For applications lacking enough straight-run, both ST75 Series and ST100L can be supplied with Vortab flow conditioning built-in to the spool-piece flow body. Its wide selection of available process connections include male and female threaded and flanges are standard. 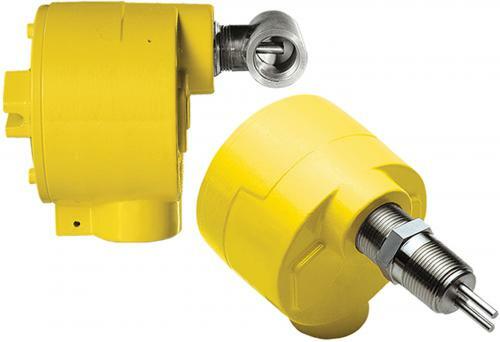 The FLT93L Flow Switch is a dual function, dual trip point/alarm point precision switch. It is field settable for trip point on flow rates and temperature, and as any high or low value of either flow or temperature. The FLT93L’s setpoint range is: 0.015 to 50 cc/sec [0.0009 to 3 fps] for water-based liquids; 0.033 to 110 cc/sec [0.002 to 6.6 fps] for hydrocarbon-based liquids; and 0.6 to 20,000 cc/sec [0.036 to 1198 fps] for air and gases. Trip point accuracy is ± 0.5% reading or ± 0.04 fps [± 0.012 mps] (whichever is higher) in liquids and ± 0.5% reading or ± 2 fps [± 0.06 mps] (whichever is higher in air or gases. The FLT93 has been designed for use and longest service life in the most rugged, harsh operating environments. It is available in both aluminum and stainless steel IP67 rated housings, carries HazEx agency approvals for FM, FMc, ATEX, IECEx, EAC, Inmetro, NEPSI, meets CRN and European PED and is SIL 2 compliant. It is available in numerous wetted materials and process connection options, and has universal DC/AC power supply. For more information on Fluid Components, Inc. products in Maryland and Virginia, contact Flow-Tech at 410-666-3200 or visit https://www.flowtechonline.com. The quality and sophistication of the MFC’s design. The application set-up, which covers the acceptable level of fluid delivery accuracy a given process requires. Metrology: what specific techniques are used to test, measure and con rm MFC accuracy. Calibration checks: how an MFC is calibrated on an ongoing basis. Please review the eBook embedded in this post below, or if you prefer, you can download your own PDF copy here - Understanding Mass Flow Controller (MFC) Metrology & Calibration. For more information about MFC's, contact Flow-Tech at https://www.flowtechonline.com or call 410-666-3200. Understanding MFC Metrology & Calibration from Flow-Tech, Inc. There are many reasons for large commercial buildings, medical centers, museums, airports, sports complexes, federal institutions and military complexes to invest in building energy optimization efforts. Better and more efficient operation of HVAC equipment can reduce the buildings energy and operational costs significantly. Controlling flow, temperature and pumps can provide energy cost savings of over 20%. Many campus energy managers believe that the biggest user of energy in any complex is the HVAC system, and the key to saving energy in HVAC systems is an accurate and reliable flow metering capability. Better efficiency of the heating and cooling infrastructure of a building also leads to more environmentally friendly buildings, something that has become a social prerogative of building owners and operators. Older buildings were not built with BTU meters as metering requirements were added to buildings through increased regulations. 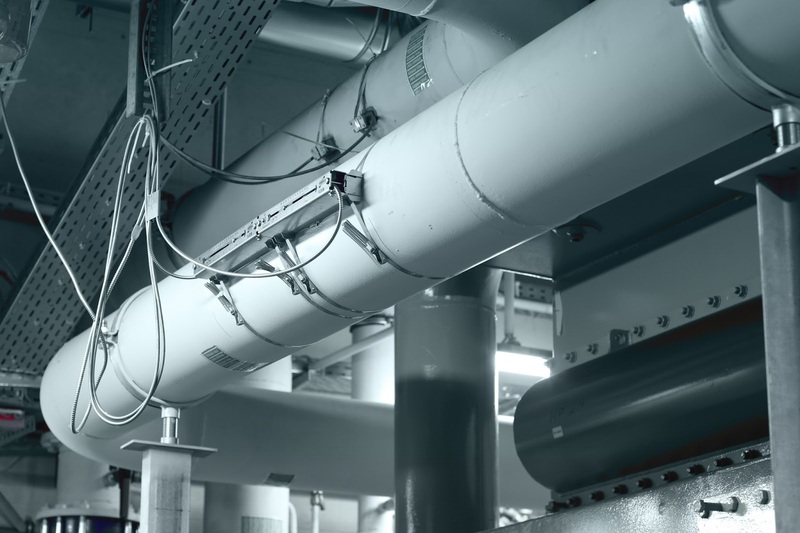 Submetering the buildings heating and cooling systems have become increasingly more important, as building owners are both mandated to meter these utilities and have a financial interest in the accuracy of these BTU measurements. The problem historically is that nearly all flow meters are designed for gradual failure due to direct contact with the fluids they are monitoring and the particulate accumulation on the sensors. Clamp-on, transit-time difference ultrasonic flowmeters are the ideal retro-fit flowmeter, and also should receive strong consideration for new building construction. Transit-time difference ultrasonic clamp on flowmeters exploit the fact that the transmission speed of an ultrasonic signal depends on the flow velocity of the carrier medium - kind of like a swimmer swimming against the current. The signal moves slower against the flow than with it. flow and one in the opposite direction. The flowmeter's transducers alternate as emitters and receivers. The transit time of the signal going with the flow is shorter than the one going against. 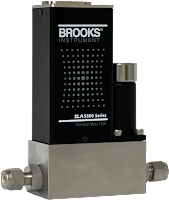 The flowmeter measures transit-time difference and determines the average flow velocity of the process medium. Since ultrasonic signals propagate in solids, the flowmeter can be conveniently mounted directly on the pipe and measure flow non-invasively. Contact Flow-Tech with your questions about any flow measurement application. Reach them at 410-666-3200, or visit http://www.flowtechonline.com. Flow-Tech, Inc. is a manufacturer’s representative and stocking distributor of process instrumentation and calibration equipment in Maryland, D.C and Virginia specializing in the Industrial Process, Control, and Test / Measurement markets.